It looks like we won't be seeing the new Valkyria Chronicles game in the States, and it's all your fault. Straight up, I kinda hate you guys sometimes. You kids with your MTV and your Facebook, you can't appreciate the truly good things in life. 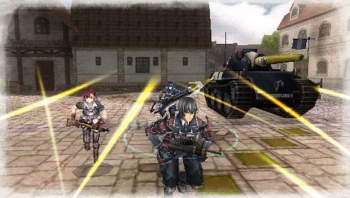 Things like Sega's gorgeous Valkyria Chronicles strategy-roleplaying series. "Oh, but we do appreciate it Nex!" I hear you shouting at your monitor. No, obviously you don't. Otherwise Sega would be localizing Valkyria Chronicles III for the English-speaking world, instead of giving Japanese gamers one more awesome title to gloat about. During a recent interview in Singapore, Sega's team manager of console sales team Hiroshi Seno confirmed that the game would not be localized due to the PSP platform not being popular and well-liked in North America and Europe. He also said that localizing the title for English-speaking audience would require past games of that franchise to sell a particular amount of quantities; he added that Valkyria Chronicles II did not sell enough to justify localization costs. Yeah, see? Sega would love to bring the game to the US, but you people didn't buy enough copies of Valkyria Chronicles II. Sega said, "hey guys, here's a rad new strategy game for the PSP," and I was like, "yay!" and you guys were like, "meh." and now I don't get to play the sequel. "But Nex, it wasn't just us. There were probably lots of other people who ignored Valkyria Chronicles II also!" you mumble, shamed by your own indifference. Yes, probably, but I can't belittle them publicly, now can I? It's like Edmond Burke never said, "The only thing necessary for Sega to totally ruin my day, is you jerks failing to buy their videogames." I swear, this is just like the Dreamcast all over again.